Go Daddy was sold to Cal McCarthy, Richmond (Vancouver area), British Columbia in April 2013. Go Daddy is enjoying his new life as a spoiled house dog and 24/7 companion as Cal's hunting and fishing buddy. Go Daddy has achieved International and National Show Champion and a Junior Hunter titles. He is a fourth generation product of my breeding program. Go Daddy's conformation exhibits a broad head and stocky build, with nice length of leg. Go Daddy is extremely athletic, yet is a mellow housedog. Go Daddy has a loving temperament and gets along nicely with other dogs and people. Go Daddy's pedigree is the best of field and show. Go Daddy's sire, FC-AFC Land Ahoy was the top Field Trial dog in the USA points wise in 2009. Go Daddy's dam, Int/Nat CH Merganser's Google CGC, bloodlines are primarily CH BISS Tabatha's Gingerbred Cutter CD, JH, CGC and Am/Int/Mex CH-MHR Cook's Midnight Bandit MH. 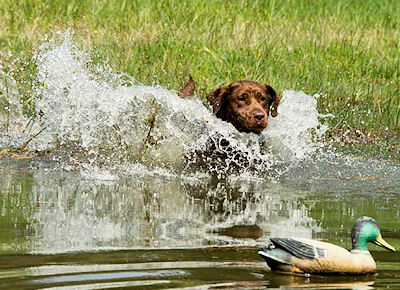 Bandit is one of the few Labradors with both a show and Master Hunter title. Cutter was the #1 Show Labrador in the USA in 1996 as well as winning 7 Specialty Show Wins, a Labrador record.